The new BL-17 figure is now being spotted in Wal-Mart stores in some parts of the United States! 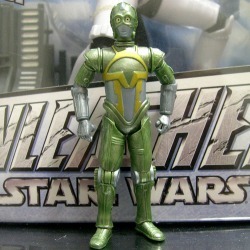 Not only that, the Boba Fett figure that he is packaged with now has a more Droids accurate paint deco! Woohoo! Two new Droids figures for 2009! I have this set now! It was a long wait since they were shown at Toy Fair in February. Pictures are up in the Action Figures section, but I still need to add the info. Here they are with some friends that waited 24 years for them to arrive! 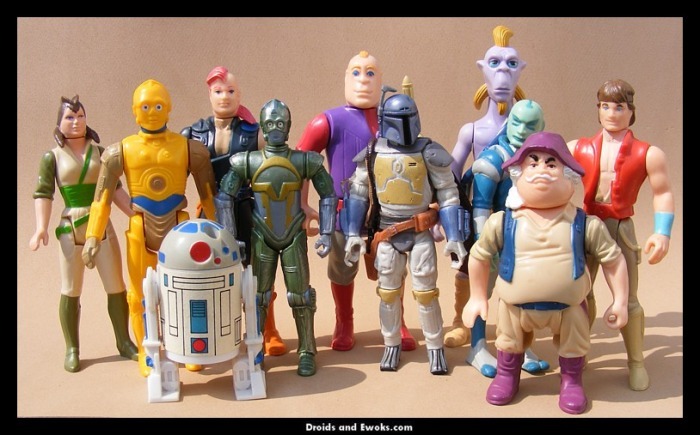 Nice group shot - I hope they expand into other characters from the Droids cartoon, Boba and BL-17 were a nice start, but there is so much more ground to cover. Well, here was the thrill of last year: BL-17 and Boba Fett (still two of my favorite modern figures)! Now we have Wicket with TV series accessories for 2010. Hasbro may say they can't really do anything about Droids and Ewoks because of LFL's whole "animated style only" mandate, but it looks like they have been seriously trying to find ways around it. I'm hopeful that they can keep up this trend and keep finding a way to put out at least one Ewoks or Droids figure per year, if not more. Oh, and we got Teek this year too, so there are glimmers of hope for all areas of 80's Star Wars TV as we look towards the future!